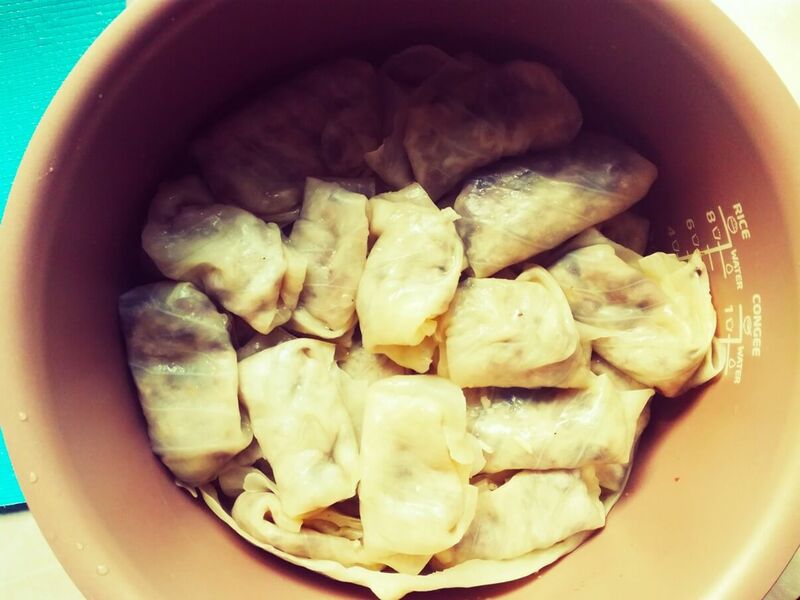 I am glad to share with you the recipe for meatless cabbage rolls (Ukrainian holubtsi) with champignons and rice. This vegetarian version is just as good as classic holubtsi. 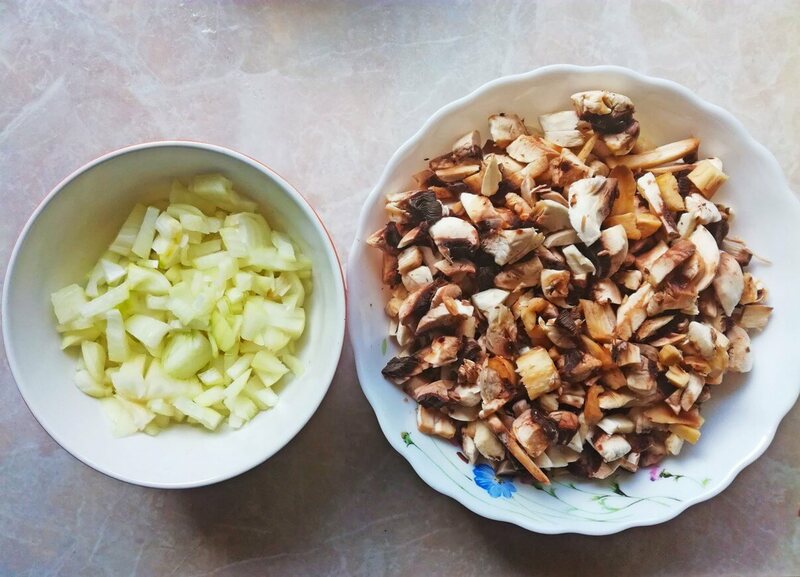 Instead of using meat, we will stuff cabbage wraps with meaty mushrooms. 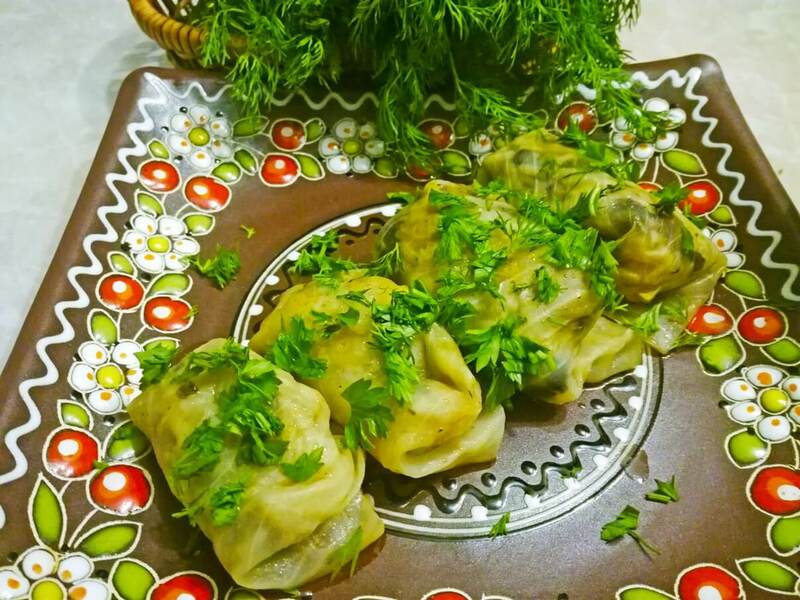 The secret of cooking really tasty lenten cabbage rolls is to reach the perfect rice-mushroom ratio and add secret spices) and by reading this recipe you’re going to find out what exactly spices to add. 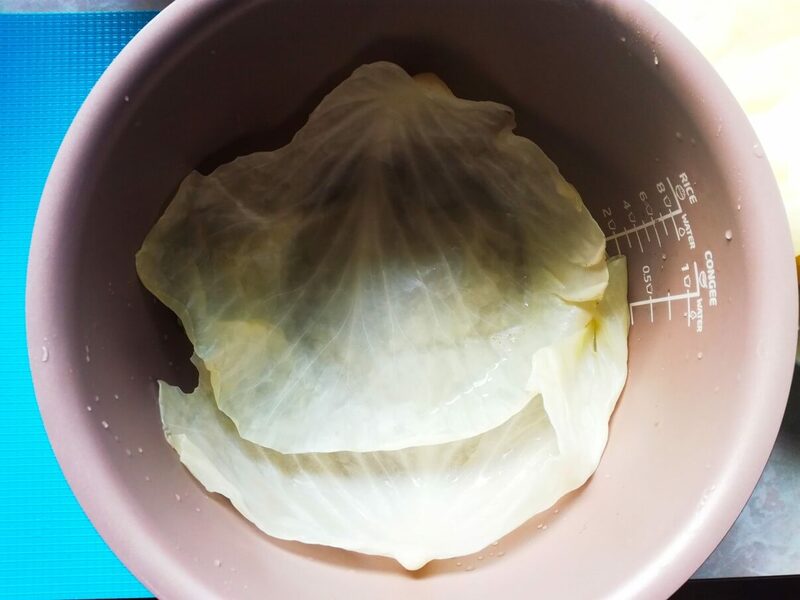 This dish will be great for vegetarians, people keeping fast, or just for those who like experiments and want to cook cabbage rolls in a new way. Wash a head of cabbage under running water. Remove the core. Put the full head of cabbage in a big pan and cover it with water completely. Bring water to boil. Then add 1 tsp of salt and stir everything. Reduce the heat and cook the cabbage over low heat. In 5 minutes, remove the softened whole cabbage leaves from the head one by one with a help of a fork and knife. Then continue to boil leaves until they become soft, for about 15 minutes. Do not overcook leaves, in another case they will tear when you start to roll them. 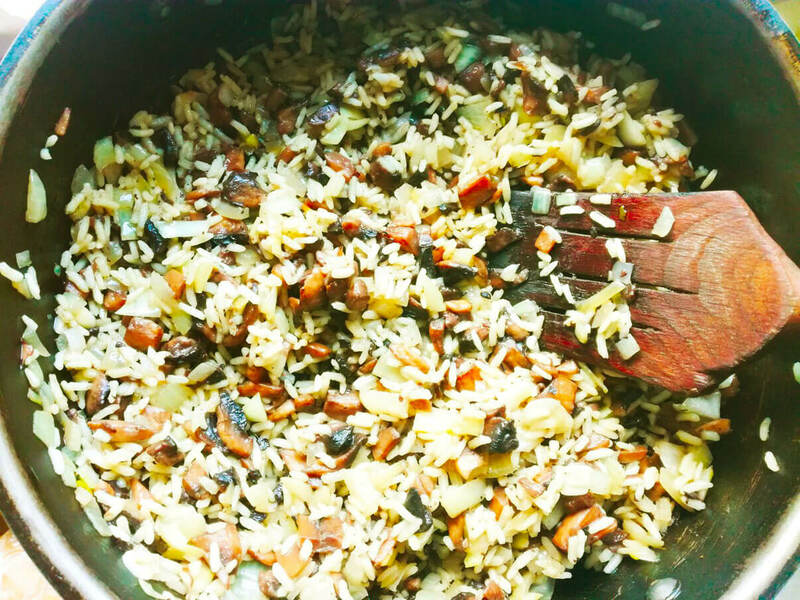 Put rice in a pan and pour 250 ml of water above. Season the rice with salt and boil it over medium heat until half cooked. Peel, wash, and cut champignons finely. Do the same with bulb onions. Peel, wash, and chop them. 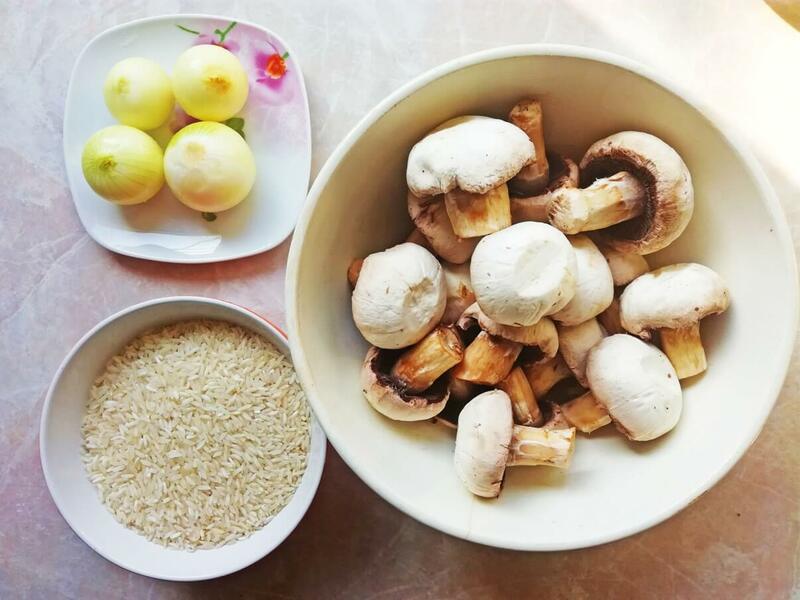 Pour sunflower oil in a frying pan and put the champignons there. Sprinkle them with salt and stir to combine. Cover the pan with a lid and start to stew the mushrooms until the water evaporates and the mushrooms start to fry. Then transfer the champignons to a separate plate. 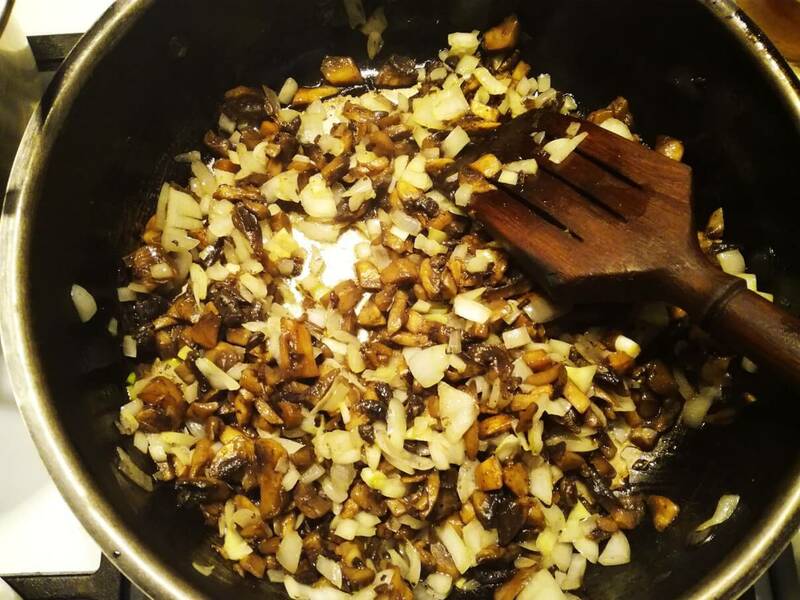 Put the onion in the frying pan where we’ve cooked mushrooms and season it with black pepper (you can add the oil if needed). Cook the onion until it starts to golden. Strain the liquid from the champignons and add them to the onion. Mix everything carefully. Then add the rice and stir the mass again. Cook it for about 5 minutes. Try the filling and add salt or pepper if needed. Set aside to cool. Season the water where the cabbage was boiled with salt. Add bay leaves, ground red pepper, black peppercorns, coriander, and tomato paste or ketchup. Mix everything carefully. 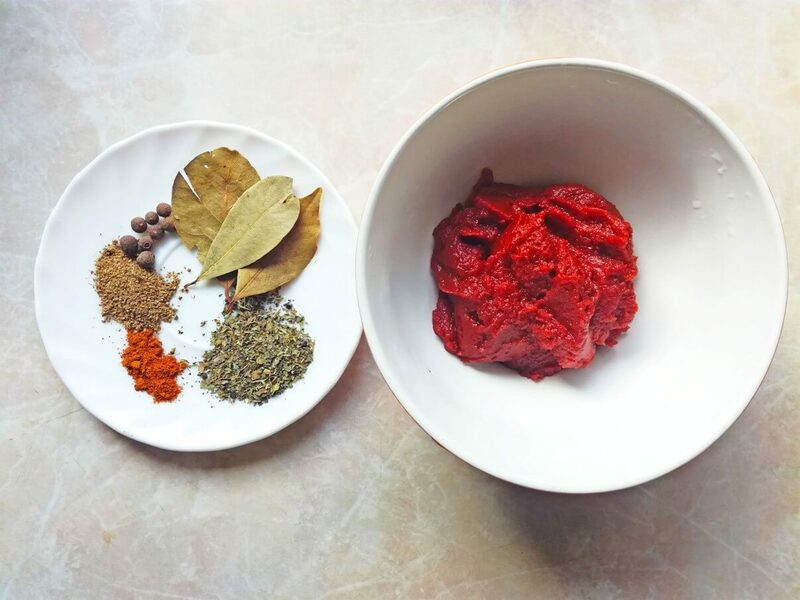 If you use tomato paste, you can add some sugar to balance the taste of the sauce. I’ve cooked holubtsi in a multi-cooker (you can bake them in the oven if you wish). Line the bottom of a pan or baking dish with cabbage leaves not suitable for stuffing. 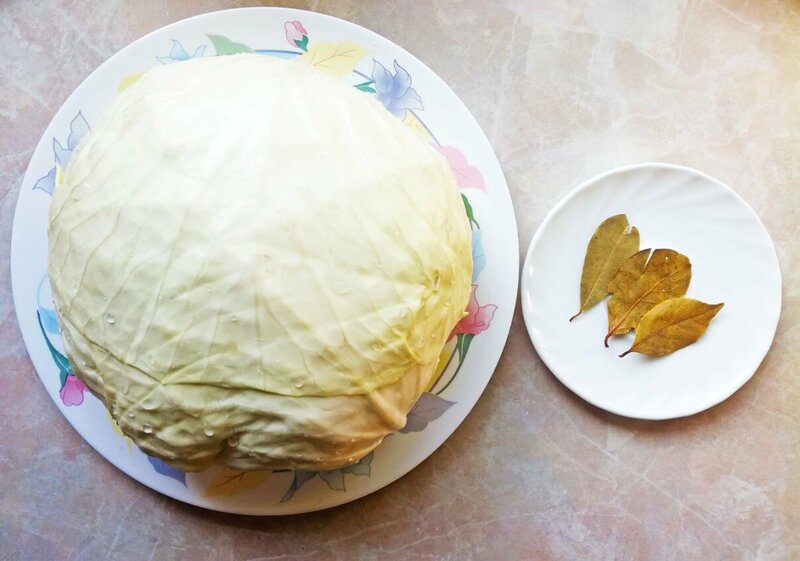 Put one cabbage leaf on a flat surface, cut off the vein near the stem (that will ease the process of rolling). 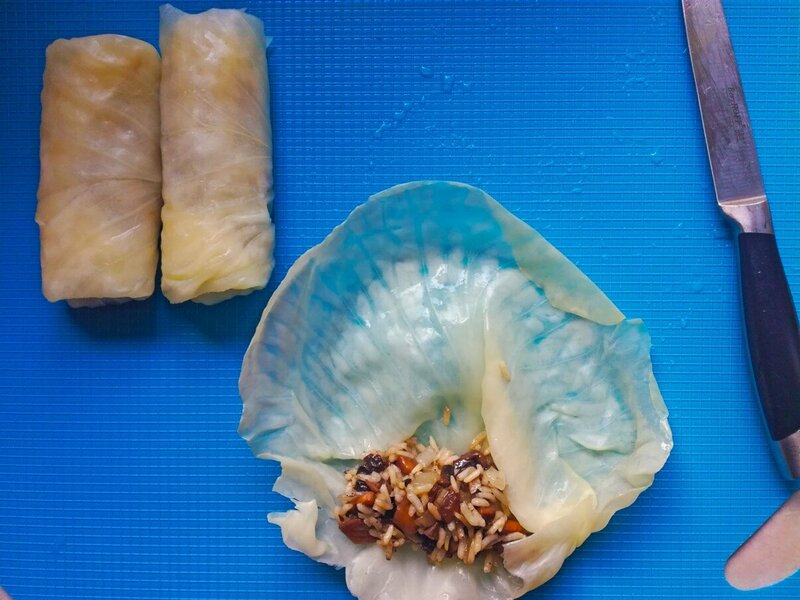 Put 1 tbsp of the filling in the center of a leaf and roll it, folding the sides inward. Place the roll seam-side down in the pan and repeat the procedure with remaining leaves and filling. When all holubtsi are rolled and arranged in the pan, cover them with a few cabbage leaves, leaving a 1.5 -2 cm (1/2 in) gap at the top. Cover the stuffed cabbage wraps with the tomato sauce, filling the pan or baking dish to the brim, to prevent drying out. Cook cabbage rolls for around 1,5 – 2 hours to let the cabbage become super soft and tender. 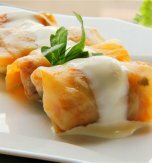 Serve cabbage rolls with chopped fresh parsley and a dollop of sour cream. You may top holubtsi with the prepared tomato sauce as well. It’s all up to your taste. 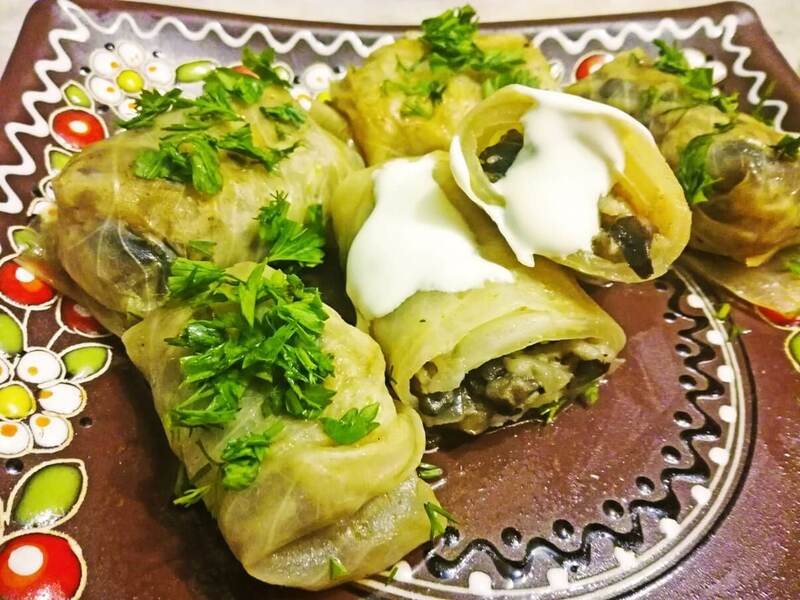 Have you liked the recipe for Ukrainian cabbage rolls with mushrooms?